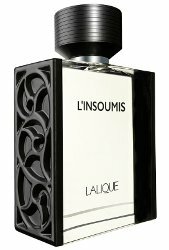 Lalique will launch L’Insoumis, a new fragrance for men, in September. The bottle was inspired by Lalique’s 1926 fern-motif Tourbillons vase. L’Insoumis was developed by perfumer Fabrice Pellegrin. The notes feature basil, rum, bergamot, clary sage, lavender, black pepper, rum, patchouli, clearwood, vetiver and moss. Lalique L'Insoumis will be available in 50 and 100 ml Eau de Toilette. Between this one and the Ferragamo. ..
Yeah, you’ll have to see them both in person. I’m ashamed to admit with all of the time I’ve spent in France (and married to a Frenchmen for crying out loud!) , that I had to look up Insoumis to see what it meant. It means ‘unruly’. Great name for a fragrance. Yes it is, and thank you because I did not look it up!